The Kasundi's aroma, texture, appearance and innovation account for 80% of the winning mark, with judges also taking into account brand story, packaging and sustainable business practice. Shoppers will soon be able to identify products that carry the gold, silver and bronze medal stickers from the 2019 Outstanding NZ Food Producer Awards – a guarantee of product quality. NoShortcuts named as 'One to watch' in NZ Food Technology magazine's 2019 annual diary. The annual NZ Food Awards showcase the best New Zealand has to offer in the food and beverage industry and celebrate creative innovations from artisan producers through to large-scale manufacturers. 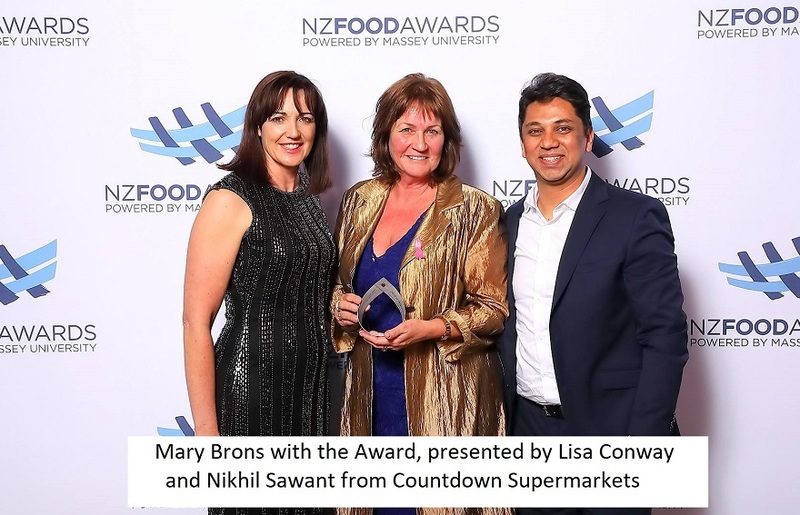 At the Gala dinner held on October 17, NoShortcuts was presented with the prestigious Countdown Supermarkets Grocery Food Award, for their innovative new product Feijoa Kasundi; an Indian style chutney that is spicy, hot, tangy and healthy. In accepting the Award, owner Mary Brons said "I cannot express how proud and honoured I am to have won this Award and equally I cannot let the moment go by without congratulating all of the other finalists - we were among such great brands, some much larger and longer standing than we are, so it is very humbling to think WE WON! When I entered this industry some 5 years ago, it was all about producing and marketing a healthy range of beautifully flavoured and textured chutney and jam products, ensuring consistently high quality and authenticity at affordable prices, to reach an ever-widening audience. This has been my dream and the 2018 NZ Food Award is tangible proof of the power of collaboration and co-operation which has gotten me to this point. I am ever grateful for this opportunity and for everyone's support." 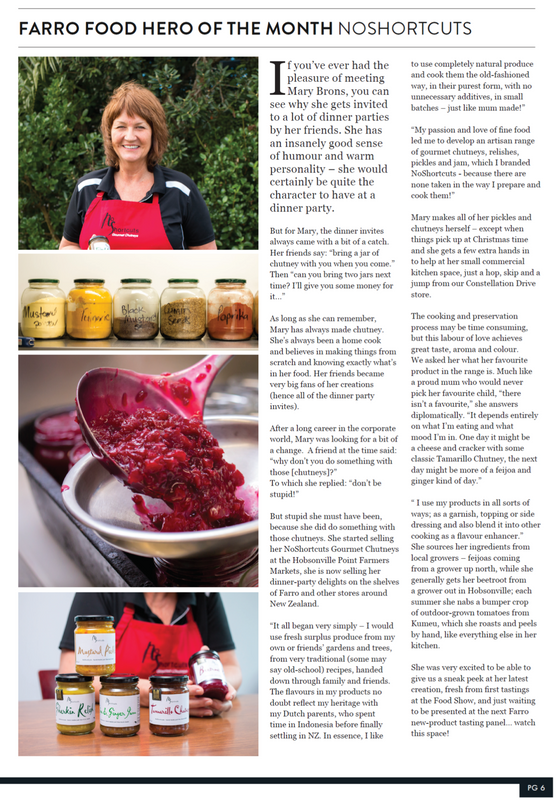 In September the 2018 Inspire+ NZ Artisan Awards announced 67 finalists, among them NoShortcuts Mustard Pickle. The Awards celebrate the best artisan producers have to offer and recognise the creativity and quality that can come from both small and larger suppliers. With 397 high-calibre entries received, the judging panel had a difficult task and stated that the level of innovation and quality made the final selection very difficult. Although NoShortcuts did not ultimately take out a win, owner Mary Brons made it clear just how proud she was to have qualified as a finalist for such a prestigious award. 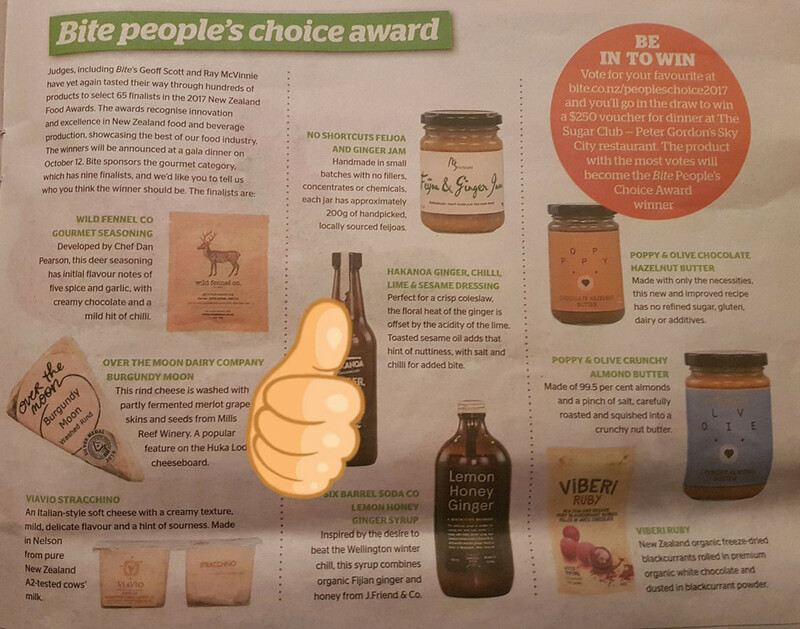 Each year these awards recognise and celebrate innovation in food and beverage manufacturing, showcasing what the organisers refer to as “the finest food producers in New Zealand”. The judges take into account taste and visual appeal, nutritional value, innovation, processing, value and shelf life – so it’s a real honour to have made it as a finalist.